Emily gave me an iPhone for my birthday in March, which was a major facelift to my communications repertoire. Further, I just finished Steve Jobs, the biography, so I'm excited about Apple and its sleek products and their capabilities. Via my new do-everything device, I've found two technologies that I like and am confident will continue to shape the way we create photos and communicate: Instagram and Tumblr. The birth of our beautiful child, Elena, was the driving reason for my initial interest in them. On the day Elena was born, I loaded Instagram onto the phone, and my use of the app has kindled a new-found liking for photography. 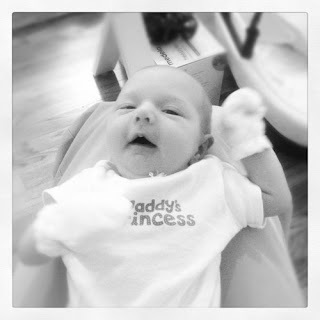 I've been using it to capture what I can of the precious moments in her first two-plus weeks. I'm on a streak to date, having snapped at least one photo of her per day. Give the tumblelog a look here. While the pictures online now are of Elena only, my intention is to diversify what's there, probably moving the majority of those taken of her onto a private page. Enjoy my pictures of the greatest gift... that of love, that of a daughter, that of little Elena. I LOVEEEEEEEEEE my new little niece!